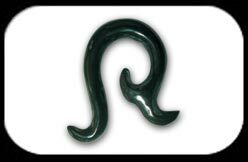 Tribal Ear Claw made made from Buffalo Horn. Sizes 4 to 14mm. These items are hand made - size & shape are approximate only.